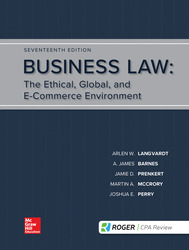 This best-selling title, written by the highly respected author team from Indiana University, takes a traditional approach to the business law course. Known as an innovator in the field, this text has pioneered by introducing materials on business ethics, corporate social responsibility, global legal issues, and e-commerce law. Aligned with AACSB curricular standards to ensure your business law course will prepare students to have a positive impact on business and society.